1914: The Workers Produce Everything! For some moments an oppressive silence prevailed. The men stared with puzzled, uncomfortable looks alternately at each other and at the drawings on the wall. They were compelled to do a little thinking on their own account, and it was a process to which they were unaccustomed. In their infancy they had been taught to distrust their own intelligence and to leave “thinking” to their “pastors” and masters and to their “betters” generally. All their lives they had been true to this teaching, they had always had blind, unreasoning faith in the wisdom and humanity of their pastors and masters. That was the reason why they and their children had been all their lives on the verge of starvation and nakedness, whilst their “betters” —who did nothing but the thinking—went clothed in purple and fine linen and fared sumptuously every day. “Robert Tressell” was the pen name of Robert Noonan, the illegitimate son of a Protestant member of the Royal Irish Constabulary and a Catholic mother, Mary Noonan. After some time in South Africa, he settled in London, where he worked as a painter. Following some political wanderings, he eventually became a socialist, largely influenced by the ideas of the artist and designer William Morris. He took up writing after developing tuberculosis, choosing the name “Tressell” as a play on “trestle table,” part of a painter and decorator’s kit. 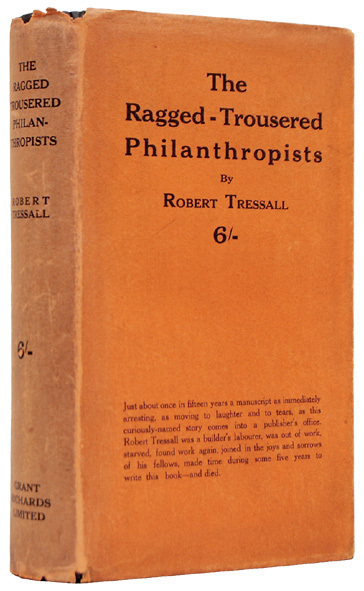 He finished The Ragged-Trousered Philanthropists, (originally titled The Ragged-Arsed Philanthropists) in 1910, but the book was rejected by several publishing houses. He died a year later at the age of 40 and was buried in a pauper’s grave. The novel was published posthumously through the efforts of his daughter, Kathleen; originally published in 1914 in an abridged version, with much of the explicitly socialist language edited out, the novel was eventually published in an unabridged edition in 1955. This entry was posted in Uncategorized and tagged 20th Century, Books, George Orwell, Ireland, Labor, Novels, Prose, Robert Tressell, Socialism & Communism, William Morris. Bookmark the permalink.